Mourinho helped carry the coffin into the church and was also seen comforted by friends and family members. Jose Mourinho had the chance to say his last goodbye to his father Jose Manuel Mourinho Felix as he helped carry the casket at the funeral. Mourinho confirmed the death of his father on Sunday, June 25 after a long-term illness. 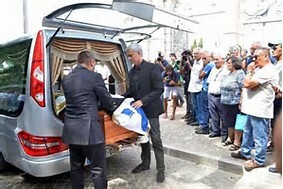 At the funeral on Tuesday, June 27, Mourinho helped carry the coffin into the church and was also seen comforted by friends and family members. His wife Matilde , daughter Matilde and son Jose Jnr were with him at the funeral. His assistant at Manchester United Slivino Louro, United goalkeeping coach Emilio Alvarez Blanco and Aitor Karanka also attended. Felix who died at the age of 79 was a former goalkeeper made his Primeira Liga debuts in 1958–59 with Vitória de Setúbal . He spent 13 seasons with Vitória de Setúbal where he won two Portuguese Cup titles. He also played for another Premeira side C.F. Os Belenenses . He had one cap for the Portugal national team before retiring at the age of 36. He kicked off his coaching career in 1976 and went on to coach the likes of Amora FC , Rio Ave FC, Belenenses and Vitória de Setúbal. As a coach, Felix won the Portuguese Second Division title three times, the Third Division once. Mourinho announced the passing of his father via his Instagram with just a photo of himself as a kid alongside his father. The Manchester United boss frequently flew to Portugal last season to visit his father who was battling with a long-term illness.